It’s taken what seems like forever to get to this stage, but welcome to the seventh Mixels review for Series 1. 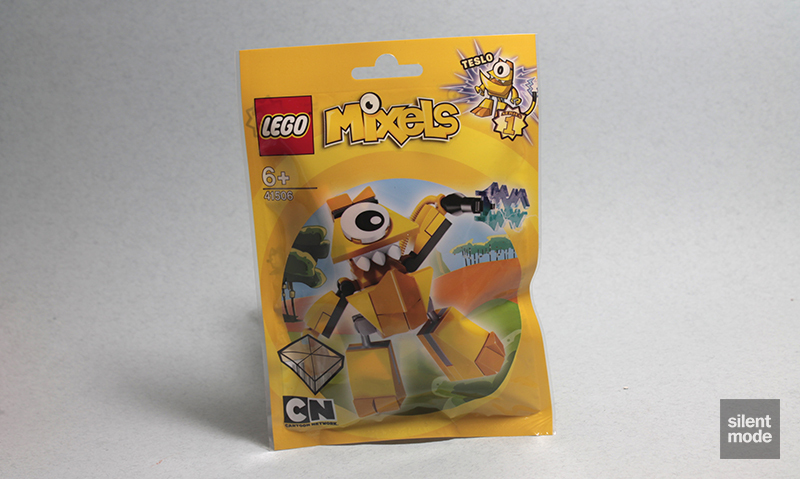 By the time I’m done there’ll be an announcement of Series 2… but for the last three we’ll be visiting the Yellow packs, which are the reserve of the Electroids (obviously electric-type Mixels). Our first guest on the SilentMode show is the cheeky-looking Teslo, who is almost named after Nikola Tesla. 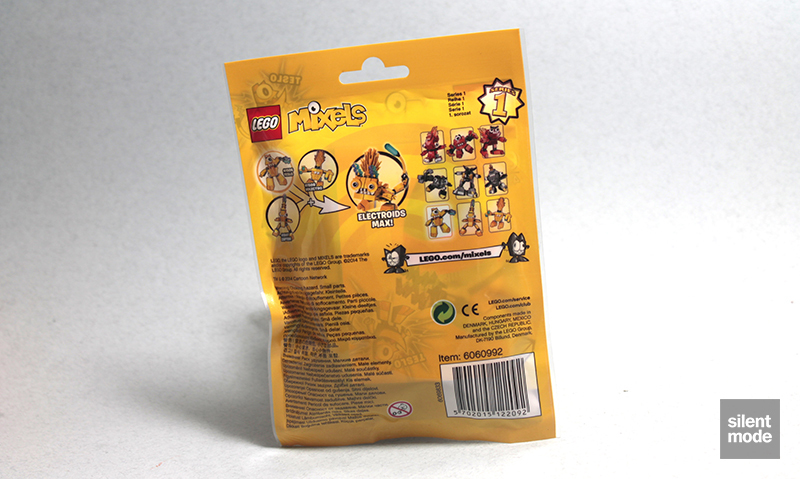 Yellow seems to be the more preferable colour for these kinds of sets, though I remember at the time of purchase not really wanting to buy all of them at once: I took a look at the models on the front of the packaging to see which ones I liked the most. I drew a blank. For the last time this series, here’s a picture of the back of the packaging; no different to the others, except Teslo is highlighted. Prepare for a couple of pleasant surprises with this set! First of all, the printed Nixel face tile indicates that we get another Nixel in this set, to go with the other two from the Infernites and Cragsters packs. The Yellow hose part with black ends (part 73590) is one of those hard-to-accumulate parts that we like to hoard, especially if you’re into Space MOCs. It’s one of just two sets so far this year that contain this part: the other being 10673 Race Car Rally (one of the new Juniors sets). One thing I really didn’t expect to see was a Black ice cream cone (part 11610), which is currently exclusive to this set – and expect ludicrous prices for this piece until it makes an appearance elsewhere. The Tan ice cream cone was one of my favourite new parts from last year, and to date appears in eight sets in total, having previously dangerously scarce. So scarce, in fact, that two girls, one cone almost took place. Another great surprise were Bright Light Orange cheese slopes, which make appearances in all of the Electroids Mixels sets. They were introduced last year in three sets, but are back with a vengeance this year. The most you’ll find is with Teslo’s band mate Volectro and in 70005 Laval’s Royal Fighter from Legends of Chima, both with 10 of these. Finally, right at the back is another currently exclusive part: the “double inverted” roof slope (part 3049) in Bright Light Orange. We’re slowly getting parts to build Bright Light Orange roofs, but accumulating them will take some time. I’ve almost forgotten these reviews are meant to be short, so let’s speed things up. As with many of the other Mixels, this familiar core forms the beginning of Teslo. It also turns out that Teslo has a rather large mouth, able to open and close with the help of a hinge brick. A familiar pair of single-point articulation legs are added, as well as a pair of stubby arms that don’t appear to be able to do much. Aww look, it thinks it can fly! All jokes are put firmly aside, however, when this bad boy is whipped out. The Black ice cream cone, Yellow hose and the electric zig-zag piece combine forces to give Teslo a very long tail that means business. Ready for action: Teslo, the Mixel that knows how to get things done. If there’s a problem, it’s nothing a few shocks from its tail can’t fix! 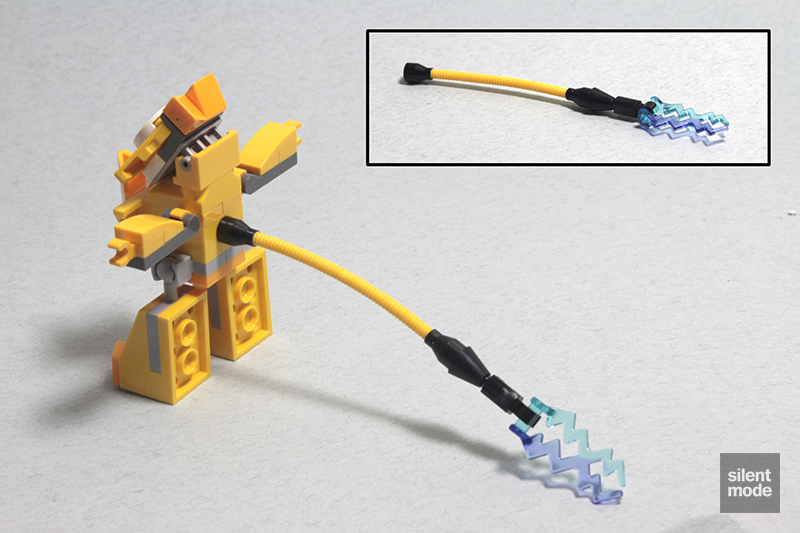 TESLO is the lookout for the yellow tribe of Electroids, a loopy tribe of Mixels who live high up in the mountainous forest to stay close to the lightning storms that energize them. TESLO has an electrically charged tail to zap any Nixels who challenge him. 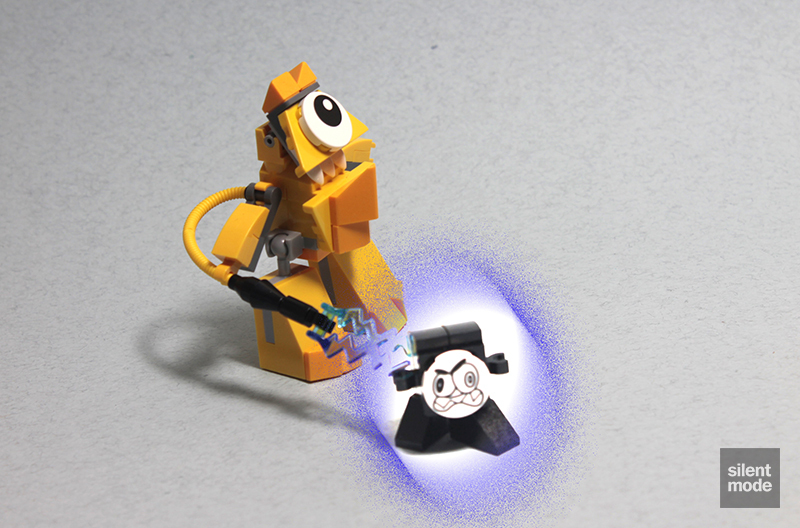 This dynamic Mixel has a secret fear of heights… well, not so secret, but the other Electroids don’t let TESLO know that they know! Here’s that other little bundle of joy that comes in the set. It uses the two Black “baby bow” parts shown above, and cleverly uses two 1×2 slopes as legs. One of Teslo’s favourite things to do is zapping the little [expletive]s when they’re not looking. A short, sharp jab on the rear gives it enough satisfaction. Teslo, I mean. This Electroid isn’t so generous, leaving us with only two spare parts… but hey, as least we get one of those cheese slopes. 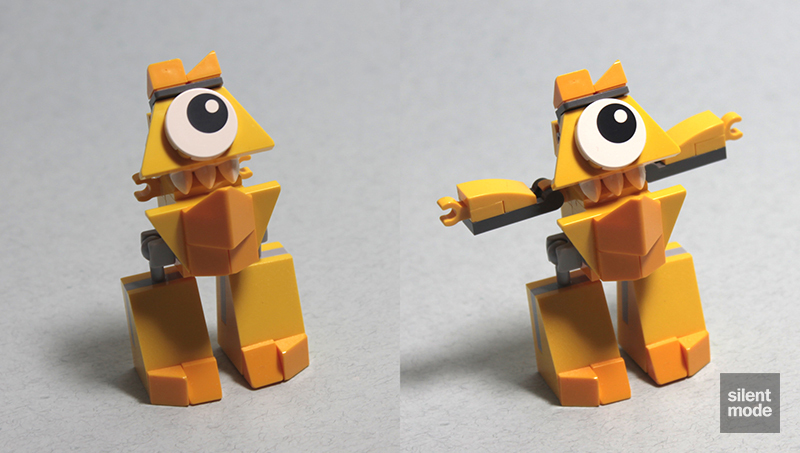 This is one of the more interesting Mixels. Even though it has stubby legs with limited articulation like many of the others, it has a couple of other interesting play features, with the opening mouth and the weaponised tail. If you’re lucky you can have Teslo carry the end of the tail in its hand, or simply use it as a whip. This is definitely one to pick up for the Black ice cream cone, and the Bright Light Orange slopes, if you want them. With that said, I’m going to give it 6.6/10.